Hadeel Ayoub, a designer and student of Goldsmiths, University of London has developed a smart glove that translates sign language from hand gestures to visual text on a screen and audible dialogue. The wireless SignLanguageGlove is designed to make communication easier for those with disabilities or impediments, and has already gone through three prototype stages. The original version of the SignLanguageGlove translated sign language gestures into visual letters on a screen, which comprised of flex sensors, an accelerometer, a microcontroller board, and a four digit graphic numerical display. Five flex sensors were attached to the glove to track five fingers, to detect bends and curvatures then reporting the values to a serial monitor. An accelerometer was attached to detect the orientation of the hand. Hadeel also developed a computer programme that recognizes the output values of the sensors and accelerometer and matches them with a series of statements that determine what letters to display on a screen. She then followed up with a second prototype with an improved model that was faster and more robust, featuring smaller, more discreet hardware and text that scrolled on a screen, deleting the old and adding the new. The third and latest prototype features a text-to-speech chip with the hardware sewn into the lining of the glove. This model went on to be displayed at the Goldsmiths MA/MFA Computational Arts end-of-degree show earlier this month. 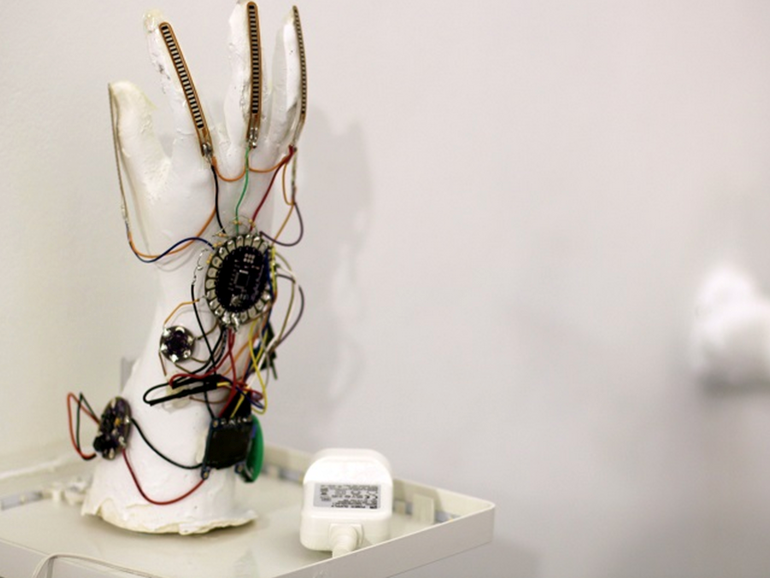 Hadeel is now working on the fourth prototype of the device, which will include an accompanying smartphone application that will receive the glove's output through Wi-Fi. As an Arabic, French and English speaker, she also intends to introduce a translation feature into the app, enabling text translation in real-time, a motion sensor for better mapping and a small glove that would be suitable for children - a new challenge to minimize glove's hardware to make it light enough for young users. Hadeel has been approached by many companies who are interested in producing the glove, and the fourth prototype is expected to cost approximately £255 ($385). However, Hadeel hopes that if the glove is made available on a large scale, users with disabilities will not have to pay for it. Instead, schools and companies will purchase them for their employees, students and patients. Hadeel says: "I had one mission when I started this project and it was to facilitate communication between all kinds of disabilities, eliminating barriers between people who have a visual, hearing or speech impairment. The prototypes each have a new additional feature, an LED light, and a speaker for example, that took me one step closer to my goal.